What are the popular places to visit in Cape Town? What are the popular places to visit in Johannesburg? 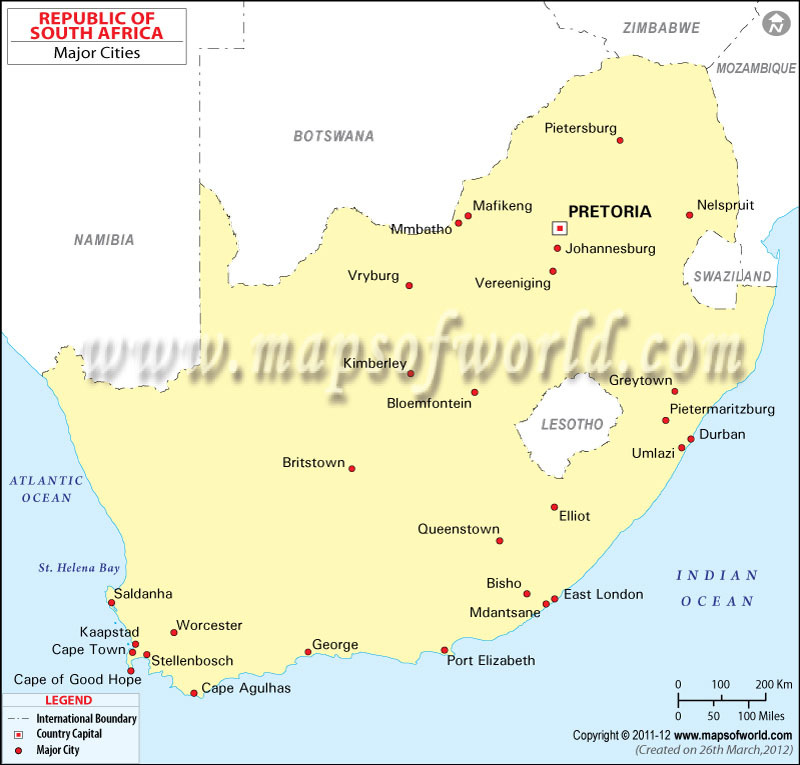 Description : The map showing all the major towns and cities in South Africa. *Note - The cities done is bold are clickable to their respective Maps and Info. Cape Town: Cape Town is one of the three capitals of South Africa. In terms of population, it ranks number one in the county. It has a Mediterranean climate, meaning the summers can be hot, but the winter months are very pleasant. The primary tourists season is between November and March. Cape Town has a bustling art culture, and you’ll find plenty of galleries and theaters throughout the city. Cape Town is also a food lover's paradise. It has been labeled by many as one ‘the best food cities in the world.’ The majority of the people speak Afrikaans, but English is also very popular. Cape Point is a popular tourist destination, not only Cape Town, but also in the entire County, and offers spectacular views of the entire waterfront. You will also find great restaurants here, serving wonderful local delicacies. Cape Town is historically very significant to the county and the continent. Here you can visit Robben Island, were political prisoners, including Nelson Mandela, were held during the Apartheid era. You can even visit the cell where Mandela lived. Johannesburg: Johannesburg is also one of the most visited places of South Africa. In terms of size, it is huge, and is the second biggest city in South Africa. The climate here is also quite pleasant, with the average temperature around 70 degrees (21 C). Mineral rich, large quantities of golds and diamonds are mined and exported from the area. Johannesburg is also well known for its Kwaito music…a different kind of music, that originated in the '90’s, with lyrics about the local culture of the city. The most popular tourist location is The Apartheid Museum. Through the help of several photos, video clips, and newspapers, it takes you through the entire journey of the life of the nationalists, during the Apartheid era. To get a peek into the mining history, many tourists also visit the Gold Reef City, as it has several buildings, shops, and restaurants, which will take you back to the old days. Bloemfontein: It is situated in the Free State of Africa. Because of its amazing location, it serves as the capital of the Free State. Compared to the other major cities, the population is a low. With the presence of some reputed universities, you will find a large number of students residing here. Bloemfontein is also extremely famous for its rose festival. The most popular tourist attraction here is The Cheetah Experience. It is a wildlife sanctuary, that is just a few miles from Bloemfontein. Visitors can take photos with endangered animals like cheetahs and leopards. Many visitors also trek to The National Museum...as it is a great place to learn about the history of the region. It features several tools and weapons, which were used in the Stone Age. Durban: Durban is the most visited city in South Africa. With a population of 3 million, it is second only to Cape Town. Because of its agreeable climate, plenty of people come here to enjoy the beaches. The average summer temperature is 74 degrees (24 C), and in the winter season, it is it rarely dips below 60 degrees. With little rain, you can expect sunshine throughout the year. With a large port, a rarity for Africa, Durban is a major manufacturing hub, and accounts for a large portion of the total revenue of the country. Because of its coastal location, Durban is home to the uShaka Marine world. This complex has a huge aquarium, where you can see sharks and other rare marine creatures. As well as an amusement park, shopping, and top-quality restaurants. Other major South African cities include Alberton, East London, Kimberley, Newcastle, Port Elizabeth, Paarl, Pretoria, and Midrand. South Africa Cities have emerged as cities of global stature, visited by people from Africa and all over the world.